Home / GST-Tally / TallyERP.9 Lessons / How to do Advance Receipt GST Voucher in TallyERP.9? How to do Advance Receipt GST Voucher in TallyERP.9? As per Clause (D) of Sub - Section 3 of Section 31 mention that Advance receipt of any amount is liable to pay tax under GST Act. 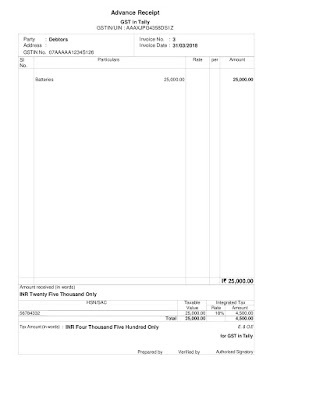 But How can we do this transaction in Tally with showing effect of GST Tax rate in the Advance Receipt Voucher. 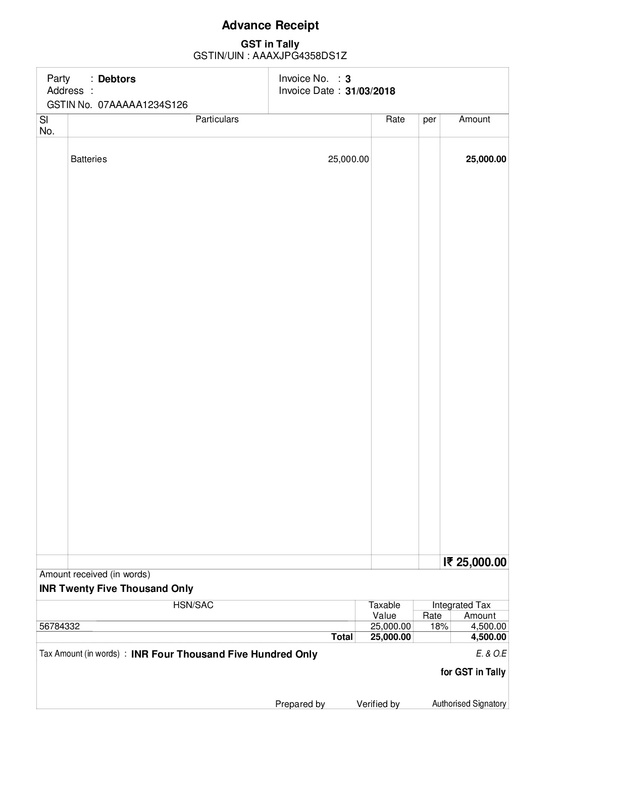 Create a Accounting Voucher, Press F6: Receipt. Now you can see a new button Advance receipt in the right side panel or you can Press ALT + V to create a advance receipt GST Voucher. Now your receipt voucher is enable for Advance Receipt appear at the top of the voucher entry. Enter your party name, now system ask to enter Advance Receipt, Select Stock Item, Ledger name left blank, Enter Amount. Tax Rate should be reflect automatic at Integrated Tax and calculate the same automatic. Enter or Ctrl + A to save the voucher. Go to bank details and open the voucher again and press Ctrl + P to print the voucher. You can see a option bottom at the Print Screen i.e. Print Advance Receipt, Select yes. Your Advance receipt voucher will be printed with GST Integrated Tax Rate as specified in the rules or as per your commodity rates. See below image for details or Download the same in PDF.